I had never considered the benefits of homeschooling. Years ago when we first moved to Ohio, I was asked if I was going to homeschool my children. At the time I was asked, my oldest was entering 1st grade, my other 3 were under 5, and I was eight months pregnant with number five. The thought of teaching my children at home...sounded…impossible. I had never really thought about the advantage of homeschooling my own children. March 2005...a year before we started homeschooling. Baby Serenity is not pictured. I enrolled my oldest in a wonderful Christian School. We loved the teachers and how well the school taught and trained the children. Several years went by, with four of my children eventually enrolling in the school. About that time, my oldest daughter had become extremely ill with Ulcerative Colitis and required surgery to remove her colon. With all of her health problems, the idea of homeschooling was brought up. Again, I thought how impossible homeschooling would be with not only the original five I already had, but we had added two more and in addition, I was pregnant with number 8. How could I even do all that? This time I sat down and seriously considered the benefits of homeschooling. In 2006, we bought all the children home. With 5 children in school, 6th grade to kindergarten, two preschoolers, and one baby on the way, I knew we were in for a ride…I just didn't realize how much I really would enjoy the journey. I enjoyed choosing my children's homeschooling curriculum. There were obviously a multiple number of choices out their, but knowing that I was the one picking out the most appropriated books for each of my children was satisfying. Because of my multiple grade levels and the need for me to have time from my little ones as well, I decided on a DVD curriculum approach. We chose Bob Jones Homeschool when it was under the Home Satellite Program. I did not have to teach them every subject, but I was available to answer any questions (and there ALWAYS were questions). At the same time, I also was able to not neglect my little ones. As the dynamic of everyone's family is different, the benefit of homeschooling is being able to choose the right method of homeschooling and the perfect homeschooling curriculum suitable for your family's learning needs. One of the benefits of homeschooling has been the opportunity to communicate more with my children. As the years have gone by, my 4 oldest are no longer little preschoolers, but have turned into teenagers. I have really enjoyed having the privilege of watching them grow up. If they had continued going to the Christian school, my time with them would have been limited to the time before school and the time after school. Add all the homework and programs the schools require and our time would have been cut even more. Getting to know my teenagers heart has been a joy. My teens are no different that other teen's emotions and needs; but I have the privilege to listen to their struggles, laugh with the fun times, and cry over the heartaches teenagers go through as they learn and grow into adults. From my new little baby to my oldest teenager, homeschooling has helped me become a better mother because it allows me to be continually in tune with the needs of my children and to try to come up with creative ways to meet those needs. In learning, laughing, eating at every meal together, and playing together, we are building a relationship that is strong and long lasting. Because we do have so many children and my husband is the Senior Pastor for our local church, we definitely needed a flexible schedule! As the years have gone by, each year my schedule changes because the makeup of our family has changed over the years. When I once had elementary and preschool our schedule was completely different from now that I have high schoolers, elementary, and preschoolers. We used to do a 5 day school schedule. School was Monday-Wednesday with Thursday as our day off; we continued school on Friday and Saturday. With my husband working most Saturdays, having the flexibility to take the same day off as my husband allows my children to spend more time with him. Now that some of our children are older, we have gone to a four day school week. The 5th "day of school" my oldest son works at church for Truth Trackers (A Children's memory discipleship program) making quizzes for the Bible verses, my other sons work at a tree farm, others are teaching violin lessons, my older girls clean for an elderly lady in our church, one teaches violin lessons, and some are finishing projects or papers. I am getting caught up on all my laundry, meal planning, grocery shopping, and house cleaning. Just following any homeschool schedule is good. One final consideration for the benefits of homeschooling is the fact that I can recognize and nurture each of my children's God given abilities and talents. My oldest son loves graphic designing, so we have given him the opportunity to design and actually sell some of his products in the business he and his dad have started together - Integrity Point Solutions. He is also working on creating children's Bible verse quizzes for children. My oldest daughter loves her violin so we invested in her teaching others so she can pay for her lessons. Another one of my children love science projects. Her favorite thing to do is get her telescope out and look at the moon…we laugh because she is our walking encyclopedia! One girl loves to sew so we bought her a sewing machine for christmas; now she loves to design headbands and purses that she sells at the local farmers market. The same is also true if they excel in any particular subject, as it can help to make a wise career choice for the future. By reducing peer pressure and providing a safer physical environment for my children's education, I can hopefully reap the benefits of homeschooling for years to come. I get the irreplaceable opportunity to influence my children at all ages. Share your Advantages of Homeschooling! 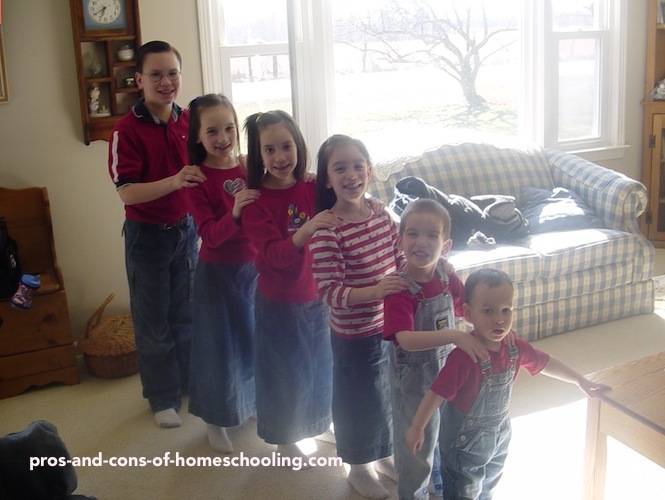 Do you have advantages of homeschooling you would like to share? I would love to hear them and post them for others to read!